Jeannette Eats Spaghetti : I scream, you scream, we all scream... for pizza! I scream, you scream, we all scream... for pizza! If you are ever curious about my ethnicity, it is half-genius, half-eeediot. I may have said that before, but I'll never know because I'm related to Forgetful Jones. 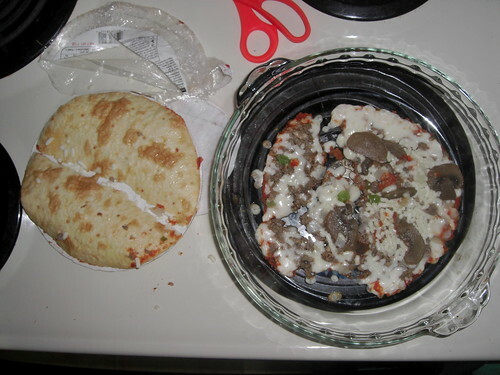 I mean, how difficult is it to cook a frozen pizza. Step 1: Look on the package to see what temperate your pizza requires. Step 2: Turn oven on and set it to the temperature you discovered during Step 1. Step 3: (Optional and from what I can tell, this is unique to me) Bust that frozen pizza in half over the edge of your counter. Step 4: Remove pizza from its packaging. Step 5: Place the pizza directly on the oven rack or on some sort of pan, whatever. Step 6: (Optional.) Set a timer so you don't burn your pizza. The recommended time will be on the packaging near where you found the temperature at which you need to cook the pizza. Step 8: Let it cool for a minute or two. Step 9: Cut that bad boy. The pizza is now ready to serve to your dinner guests. Recently I screwed up somewhere around steps 4 and 5. That's right, I managed to cook the pizza sans crust. Cheese and toppings only for this Top Chef. PS - if you're wondering why the crust is in two pieces, see Step 3.
you can order pizza from Bellacino's Pizza and Grinder and grab the offer Buy One Get One Pizza Free. Also you can visit at http://www.clickmycoupon.com/business/Bellacinos-Pizza-and-Grinders/37500036 for more offers from Bellacino's Pizza. Ok, invest in oven mitts. Not the $2 oven mitts - real, not-going-to-burn-through oven mitts. OR, just live with the burn marks. Maybe it's because you forgot to wear the safety glasses - as in the picture!